We’ve tried lots of cat “trees” here at KHD. Everything from the ultra-cheap to the ultra-plush. 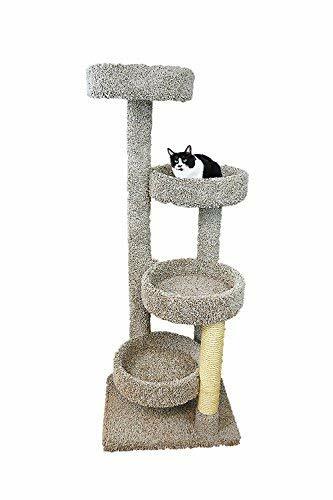 While all of these cat jungle gyms were certainly adored and used every day, none presented the value and durability of the products from New Cat Condos. We tried two different models. The Large Cat Gym and the Large Cat Tree Playground. The Large Cat Gym is a very well-made cat tree. It arrived almost completely assembled. All we had to do was connect three pre-assembled pieces to the base and vacuum up all the loose carpet fibers to make sure the cats didn’t accidentally ingest them. This isn’t a knock against New Cat Condos. It’s simply a fact that new carpet sheds a bit. The build quality is impressive with solid wood, unoiled sisal scratching post, and thick, durable carpet. All the hardware is top notch and the whole thing is very sturdy, even with two cats battling for the top position. All our cats loved this one right off the bat. In fact, they could hardly wait for us to get it assembled. They were climbing all over the pieces on the floor the second we unboxed them. The top tier is the most coveted position, standing a full 5’ off the floor. It’s important to note that while the top tier is the only level with sides, the scooped levels are just as attractive to the cats while not impeding their ability to run up and down the tree at will (more on this later). We give the NCC Large Cat Gym five out of five stars. In fact, we’re considering purchasing a second one because the price is so reasonable. At the time of this writing, Amazon sells this unit for $112 and NCC’s site lists it at the same price with flat rate $4.99 shipping. We cannot stress enough what a bargain this is! Many cat trees of this size and quality sell for two or three times as much. The NCC Large Cat Playground is just as well made as the Gym. At 61”, it’s one inch taller than the Gym. The design is sturdy, if a little top heavy when a cat is in the bowl on top. Yes, it teeters a bit, but we’ve never felt that it might tip over, not even when our daredevil cat, Lucy, leaps from the top over to the bed. The cats didn’t take to this cat tree right away. 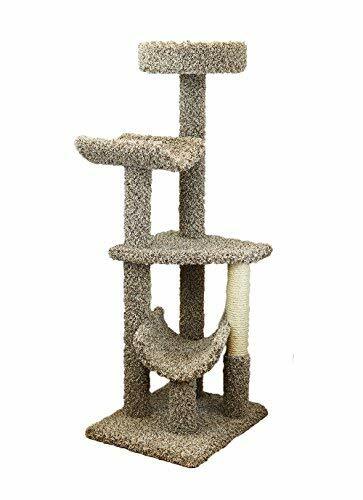 We believe it’s because all of the other cat trees they’d experienced before had flat lower levels without sides, making it easy for the cats to run right up the trees without any issues. This particular design with bowls at every level made that difficult for them. Yes, they could climb it, but it was a lot harder for them to do so. They use a nearby cat tree to use as a ladder to get to the top of this one. We intended to replace that tree, but it remains to this day. Overall, we would grade the NCC Large Cat Playground three out of five stars. We like it more than the cats do. If the lower levels were simply flat circles, this would easily be a five star tree for us as well. It doesn’t help that this tree is also more expensive than the Gym on Amazon (around $130), though NCC’s site currently lists it on sale at $106.99. With their flat rate shipping charge of $4.99, that puts both trees in the same price range. We highly recommend the products from New Cat Condos. They’re very well made and conscientiously produced at attractive prices. The company makes an extensive line of products so we suggest you peruse their web site at https://www.newcatcondos.com/ before making your choice. Cats differ in their tastes, so bear their preferences in mind. While our feline friends had some difficulty with the Playground, your cats may find it to be the best cat tree ever!